Churchill Downs, home of the Kentucky Derby, has a storied history and has drawn vast crowds year after year for over a century. The racetrack was founded in 1872 by Colonel Meriwether Lewis Clark (yes, he’s the grandson of William Clark of the Lewis and Clark Expedition!) and the Kentucky Derby was started in 1875. Clark had attended the Epsom Derby in England and was eager to showcase horse breading in Kentucky. Why Churchill? The 80 acres of land that became Churchill Downs was owned by Clark’s uncles, John and Henry Churchill, and leased to Clark. 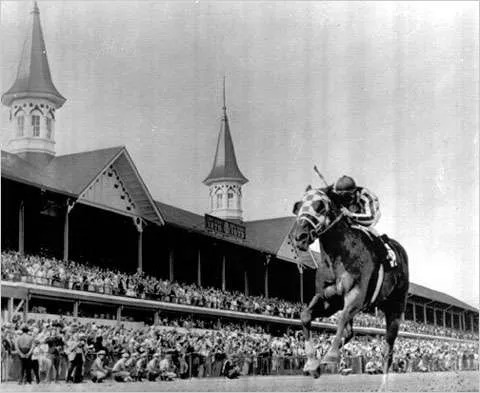 Today Churchill Downs consists of 147 acres, hosts derby crowds of more than 170,000 people, and still, in the middle, the 1895 grandstand with its twin spires stands tall, a recognizable symbol of the Derby. I had a chance to visit Churchill Downs on a recent cloudy late afternoon. Even the cold wind couldn’t detract from the place: the history and excitement around the Derby are palpable. The history and museum exceeded my expectations but the architecture? Let’s just say this is the Super Bowl of horse racing and the architecture shows it. Churchill Downs has expanded manyfold since its original construction. The newest entrance looks like something straight out of Las Vegas but once you get past the unnecessarily large columns and the gold lettering, there is the historic grandstand with the twin spires, still in the heart of it all. There is the tunnel through the historic grandstand, through which the jockeys walk their horses for each race. There are the wagering counters, still accepting cash only. And, as you step out next to the track, there are the rows of seats where, our tour guide says, even the owners can’t see the race when everyone stands up but you can hear it. There is a famous quote that equates architecture to frozen music. In many cases, time moves forward and architecture is hardly frozen. As an architectural historian I love historic architecture but, as is common misconception about historic preservation, I am not opposed to change. The entrance to Churchill Downs came across to me first as garish but then as suitable. This is the biggest horse race in the United States and they draw millions of dollars in bets. If it still stands in a hundred years, that current entrance will provide a continued story in the history of the place. For now, for Churchill Downs, the history is half in the architecture and half in the air of the place. And I’m already excited to watch the Kentucky Derby this May. Churchill Downs has a brief history here and a longer history (with historic photos!) here. If you’re in the area, I highly recommend the museum, which is on site at Churchill Downs. This PBS article on the history of the Kentucky Derby includes a photo of the twin spires when this building was the only grandstand! Time Magazine has a great photo essay on Kentucky Derby Hats History. 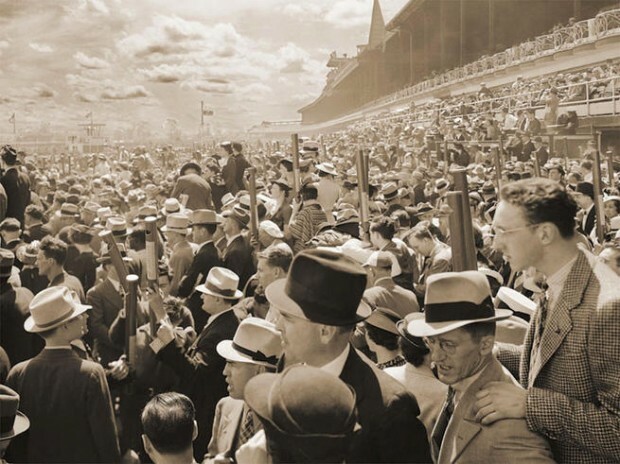 Chicago Tribune photos from 1920s-40s of the Kentucky Derby. Inspiring architecture. Unlike so many boxes that are dotting the landscape these days. Maybe because we are all a little too boxed in in our thinking also. What do you think? I missed this comment before but it is a good one! The mix of time periods represented in the buildings at Churchill Downs makes it a fascinating architectural story. And, having historic buildings certainly helps us have a frame of reference and not get “boxed in.” Of course, I’m always a proponent of historic buildings!